Wee Binnian is a little stump of a hill that sits very much in the shadow of its bigger neighbour, Slieve Binnian. It is an outcrop of granite that juts out of the southern slope of Slieve Binnian, and the Mourne Wall dutifully runs over it on its way to/from Slieve Binnian. Starting from the Silent Valley Reservoir car park (4.50 for relatively secure parking, Euro not accepted) I found a track near the duck pond which led through the trees to the start of the Mourne Wall. A stile gets you over another wall to begin the haul up alongside the main Mourne Wall. It is then a simple case of following the wall up and over Moolieve, and on to Wee Binnian. 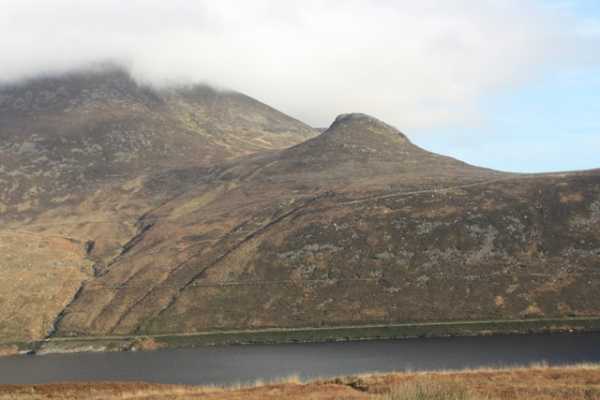 The views open up of the Silent Valley, with Slievenaglogh featuring prominently on the other side of the reservoir. Near the summit of Wee Binnian tracks skirt to the left to avoid steep mini-cliffs of granite. The summit is one large lump of granite with the usual cracks, striations and hollows of erosion. The steep slope of mighty Binnian looms immediately to the north and almost overwhelms this little lump. Further afield Doan, Carn Mountain and Slieve Muck rise in the bog to the NW. Knockchree and Slieve Foye appear out of the clouds to the SW, while to the south and east flat farmland leads to the sea. However the best views are the immediate ones - Slieve Binnian, the reservoir below and Slievenaglogh.